Adornments & Delights: Five Jewelers Courting Nature. This exhibition presents five extraordinary, highly accomplished and nationally recognized jewelry artists: Susan Hamlet, Linda Kindler Priest, Claire Sanford, Mary Hughes, and Caro-Gray Bosca. The exhibition focuses on their unique voices exploring nature. The show contains 67 pieces of jewelry, as well as silver holloware and sculpture. in partnership with Pacific Northwest College of Art, CraftPerspectives Panel. Over three evenings, explore contemporary art practice in the state of Oregon with the Hallie Ford Fellows in the Visual Arts. Each panel features individual artist presentations followed by a moderated conversation around a central question that currently influences the local creative climate. In SNAG’s ongoing effort to listen to what the past and current SNAG membership is interested in, we initiated a discussion forum on Facebook in 2012 in which we consult with members of the larger metalsmithing community about currently offered SNAG programs. This group allows for the metalsmithing community to have a direct communication pipeline to the SNAG Board and to weigh in and add constructive ideas to new programs that would benefit a wide range of metalsmiths. In turn, the Facebook group members (some of whom are not current members and therefore out of the information pipeline) receive the most current information about the newest SNAG initiatives under way. Out of the Facebook initiative grew a core group of 8 people (4 past and current SNAG members as well as 3 SNAG board members and the Executive Director) who now regularly engage in in-depth programming discussions, the goal of which is to identify and implement exciting new SNAG programming that will add significant benefits for a wide segment of the metalsmithing community. 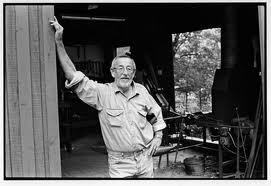 The legendary blacksmith, L. Brent Kington passed away on Thursday February 7. Brent was one of the founding members of SNAG, the first SNAG President, and the recipient of our Lifetime Achievement Award in 2011. He built the metals dept at Southern Illl. Univ at Carbondale in the late 60s and early 70s. He brought blacksmthing into the program and it is today still the only school that offers an MFA in Blacksmithing. he has a long record of accomplishments as educator, blacksmith master and mentor. He has also received honors from the National Endowment for the Arts, the Artist-Blacksmith Association of North America, and received the Gold Medal from the American Craft Council. For more information on Brent Kington’s life and work read the transcript of an interview conducted by Mary Douglas for the Archives of American Art, Nanette L. Laitman Documentation Project for Craft and Decorative Arts in America, for the Smithsonian Institution at http://www.aaa.si.edu/collections. Grosse Pointe Park resident Clare Morison died Sunday, December 2, 2012, at the age of 66. Clare was pre-deceased by her long-time partner, Phillip Fike, professor and head of the Metal Arts Department at Wayne State University, and a founding member of SNAG. Widely known for her artistic talents, she developed “Studio Clare” into a thriving business to create and market wax and metal art work. She developed innovative technologies such as high-temperature wax to expedite her work. Some of her ornamental works have won prize recognition as serious works of art. She also crewed on the beloved family sailboat, Sunshine, a frequent competitor in the Bayview/Mackinaw race and worked tirelessly on its upkeep as a true labor of love. Claire was also an enthusiastic participant for Habitat for Humanity in New Orleans after Hurricane Katrina. Clare Morison very generously left a $10,000 bequest to SNAG, naming the organization as the beneficiary of one of her IRA’s. We are deeply grateful for her support.